Designed to replace analog automotive cluster displays, 12.3 in. A-Si TFT LCD HD (1920 x 720) automotive cluster display can be programmed to provide critical information to driver. Super fine TFT (SFT1) display technology maximizes viewing angle, while high-intensity backlight produces 1,000 cd/mÂ² for sunlight readability. Cut on top corners, design fosters facilitated fitting in automotive clusters. CHINO, CA – Tianma NLT USA has announced a 12.3-inch A-Si TFT LCD HD (1920 x 720) automotive cluster display with corner-cut design developed by Tianma Micro-electronics. Designed to replace analog automotive cluster displays, it is compatible with the outline of a typical automobile cluster in which the display can be programmed to provide critical information to the driver. Tianma uses super fine TFT (SFT1) display technology for a wide viewing angle and a high intensity backlight that provides a brightness of 1,000 cd/m2 for sunlight readability. 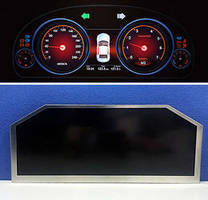 As opposed to competitive LCDs that have a rectangular shape, Tianma Micro-electronics’ display is cut on the top corners, providing a design that fits more easily into automotive clusters. Tianma will provide a design spec upon request. A prototype of the new 12.3-inch automotive cluster display will be at SID Display Week 2016, May 24-26, San Francisco, CA, in booth 905. When this display goes to production, it will be available for OEM sales through Tianma NLT USA. For more information regarding OEM sales, contact Tianma NLT USA, Inc., 13949 Central Ave., Chino, CA 91710. 1-909-590-5833; info@tianma.com; usa.tianma.com.